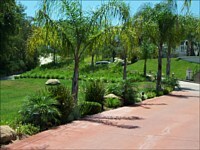 California Creations is known in the state for providing outstanding landscaping services. 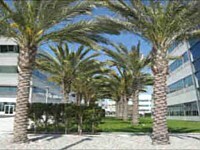 We are a full-service landscaping firm that can handle all kinds of landscaping projects. Every landscape that we create is a masterpiece and custom built according to our clients' desires. Let us help you achieve your dream outdoors by hiring our landscaping services today. We can create your own personal sanctuary where you can enjoy the beauty and the relaxing ambiance of nature. Our installation crews can also build for you exquisitely designed landscape features and amenities to give you the best outdoor living experience. We can also work on a specific theme to reflect your design taste and personal lifestyle. For over twenty years, we have been providing our expert services to residential and commercial property owners in Thousand Oaks, Los Angeles, Santa Clarita, and other key cities in Southern California. We are 100 percent sure that our creations will also make your property standout in terms of functionality and aesthetics. Call (818) 833-1231 now. Clients from Thousand Oaks and other nearby areas can take advantage of our decades of experience in the landscaping industry. This lengthy experience has helped us hone our skills in the different facets of landscape work. From simple landscaping tasks to more ambitious projects involving commercial properties, we can handle them with great ease and utmost proficiency. Here are some of the landscaping services that we offer. Design. We have in our company some of the most creative landscape designers in the state. They are experienced and updated on the latest trends in the landscape industry. Our landscape designs are unique and carefully planned to suit the needs and preferences of our clients. We make sure that important design principles such as harmony and balance are properly observed during the design process. Moreover, our use of modern design tools allows us to create full-color design renderings. Installation. You can hire us to build and install various landscape features and amenities. We can install turf, annuals, perennials, shrubs, trees, and other types of plantings. We ensure their health by installing efficient drainage and irrigations systems. But our expertise is not limited to softscape installation -- we are also capable of building various hardscape features, such as retaining walls, sitting areas, walkways, driveways, and garden steps. We are also experts when it comes to building gorgeous outdoor living areas, particularly patios, pool decks, gazebos, and outdoor kitchens. And the good thing about hiring us is that we are the only company in Thousand Oaks, CA that can offer all these landscaping services. Maintenance. We are the people to hire for all your landscape maintenance needs. Our crews are skilled and properly trained in various aspects of lawn and landscape maintenance, so you are guaranteed of outstanding results regardless of the job's scope and complexity. We can mow lawns, apply fertilizers and mulches, perform shrub pruning and tree trimming, install sods, maintain flower beds, pressure wash paved surfaces, repair sprinklers, use pest and weed control solutions, and many other landscape maintenance tasks. 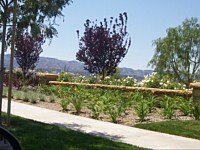 At California Creations, we are committed to provide clients with the best landscape possible. We know that skills and experience are not enough to create beautiful and long-lasting landscapes, so we make sure that the materials and supplies we use in our projects are of premium quality. From plantings to pavers and irrigation products, we only source them from reputable suppliers. 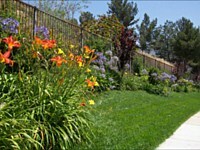 Call (818) 833-1231 now to get topnotch landscaping services at client-friendly rates.